The city of Dallas is growing very rapidly. I have only lived here for 3 years but I have seen so many new residential complexes, office buildings, and restaurants being built all across the city and beyond in such a short amount of time. And with that, so many successful eateries from other big cities are coming to the Big D as well! Some of them we might have even seen on television and all over social media. It's all good, I love trying new places. But when it comes to burgers, I feel like you gotta go with a local joint. Because Texans know their meats. With that being said, I'm just gonna put it plain and simple : Hopdoddy is still my favorite burger joint in Dallas. You could never go wrong with their famed all-natural burgers, which have been featured on major publications like Buzzfeed and GQ magazine, their handcut fries, and craft beers & cocktails. Like so many other hip, health-conscious food/lifestyle establishments we have today, Hopdoddy hails from Austin, Texas! Without a doubt, they know how to make some good burgers and they surely are still my favorite burger joint in Dallas. Our go to side dish slash appetizer is definitely the Truffle Fries!! The cheese crumbles on top and the creamy dip go so well with the fries. The Chile Con Queso is also bomb, but we didn't get to order it during our last visit there. I love the diverse options they offer here! What's a trip to a burger joint without a sip of some good milkshake, right? I love how they don't just serve basic chocolate, strawberry, or vanilla shakes here. They have Stout Chocoalte, Red Velvet, and even Orange Dreamsicle. My favorite is their thick and delicious Nutella & Chocolate Pretzels milkshake. They actually put a generous amount of pretzel chunks in it and you can really taste the Nutella. It's crunchy, sweet, and salty --- everything that you want in a dessert drink. Okay, now for more of a grown up drink, I like the ParkciTea (in Austin, they call it SoCo Sweet Tea) which is made of house-Infused lemoncello (we had lemoncellos at our wedding after party! we love this awesome drink! ), Deep Eddy Sweet Tea Vodka, raspberry purée, & and lemons. Refreshing, delicious, but not too boozy. It's a good day-drink for me! If the pictures above don't make you drool, I don't know what does. The one in the pic above is called Thunderbird. It's made of Chicken, Apple-Smoked Bacon, Tillamook Pepper Jack, Avocado, Seared Poblanos, Pico de Gallo, Chipotle Mayo, and Green Leaf Lettuce. 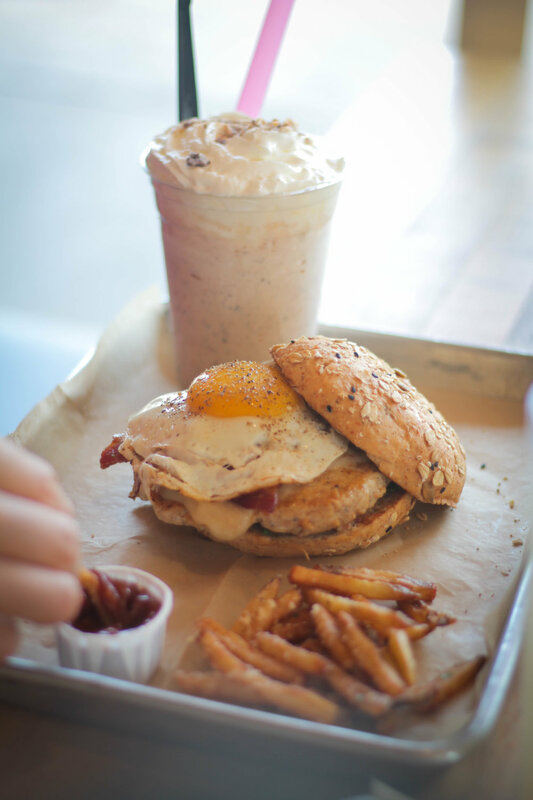 To make it even more awesome, we asked them to add a sunny side up egg on top (yes, you can do that!). This one on the photo above is my favorite because I love brie cheese! It's called PrimeTime and it's made of American Grass Fed Kobe Beef, Brie Cheese, Arugula, Caramelized Onions, Truffle Aioli, Steak Sauce, and Tomato. The spicy kick of the arugula balances the creaminess of the brie cheese. And the caramelized onions are just gold! My other favorite is the GoodNight/ Good Cause, which proceeds ($1) go to supporting a charity that Hopdoddy supports. It's made of Angus Beef, Tillamook Cheddar, Caramelized Onions, Sliced Jalapeno, and Hickory BBQ Sauce. I love the spicy kick from the Jalapenos! But if you ain't ready for such firework in your mouth, just go with the Classic Burger. If you're feeling adventurous, try the Terlingua, it's got Corn Fritos and chile con carne in it! I was surprised to find out that they now serve Kids Menu! It was always tricky to find something that J could eat there, and we always ended up getting him just burger patties and fries (which are delicious!). But it's even better now that we can just order him a kids' burger, with perfectly-portioned fries and a side of juice/chocolate milk. That way my kiddo gets his tummy filled and I get my burger fix plus some good cocktails -- everybody wins!